We know that the issue of the gender pay gap is complex and the product of many contributing factors. Closing it will require a multi-level strategy. This is why the Equal Pay Coalition has compiled the following 12 steps. While none of these efforts will close the gap on their own, we believe that change is possible, and that in concert they will contribute to our goal of a 0% gap by 2025. Pay equity is not a privilege or a frill. It is the law. The right of those doing “women’s work” to be paid on the same basis as those doing “men’s work”–or the right to be free of pay discrimination in employment and to be free of barriers to economic equality–is a fundamental human right of Ontario women which is guaranteed by provincial human rights laws and by international commitments made by Canada. systemic human rights remedy for past and ongoing discrimination. It is a fundamental legal obligation of all those who govern, regardless of their party, to co-operate to take the necessary human rights measures to close the pay gap. Discriminatory pay gaps are a violation of human rights, and human rights enforcement is not a partisan issue. The Equal Pay Coalition is calling for enforcement on this human rights issue. The Ontario Government and all municipal councils should enshrine an annual Equal Pay Day in April each year. There is still a lack of understanding about the gender pay gap in Ontario. The Equal Pay Coalition wants to raise awareness about pay and employment equity issues by including education in schools and by having an annual Equal Pay Day. For the past several years, Equal Pay Day in Ontario has fallen in April, representing the fact that on average, women in this province must work more than 15 months to earn what men earn on average in 12 months. Businesses should embed awareness of closing the gender pay gap in business vision, values and goals. Awareness of pay and employment equity issues and compliance should also be embedded in educational curriculum for students. Governments develop detailed plans key on public policy issues such as health care and the economy, yet they have not done so for closing the gender pay gap. This is unacceptable. Solving a persistent problem requires leadership and planning–analyzing what works, what doesn’t and what further steps or revisions to a plan are necessary. The Coalition calls on Ontario Premier Kathleen Wynne, NDP Official Opposition leader Andrew Horwath, and Progressive Conservative Leader Patrick Brown to work with the Coalition, employers, trade unions and other equality-seeking stakeholders to develop, implement and resource a province-wide plan to close Ontario’s gender pay gap by 2025. Women have already waited too long. 2025 is the year Ontario is to be barrier-free for persons with disabilities. We should also be able to end pay discrimination by then. There are various existing laws and policies already in place to close the gender pay gap, but they are unevenly enforced and don’t cover everyone. The Equal Pay Coalition is calling for the expansion and proper enforcement of these laws. The EPC would like to see part-time, contract, and temporary workers covered, the implementation of a new transparency standard, full funding for pay equity adjustments, improvements to union access, and proper funding for the Pay Equity Commission, Pay Equity Hearing and Tribunal, and Human Rights Commission Tribunal. Pay equity laws and policies are directed at ensuring that men and women are paid equally where they do work of equal value. Employment equity laws and policies are directed at ensuring that steps are taken to remove barriers and take positive measures to give women equal access to higher paying, often male-dominated work. Employment standards and labour laws set the minimum floor of rights for employees. All these laws and policies are necessary to work together close the gender pay gap. All employers must comply with the existing Pay Equity Act, Employment Standards Act, the Labour Relations Act and Human Rights Code obligations. A new pay transparency standard that would require employers to report and post their pay systems and practices including wage and pay structures, any merit pay systems, the occupation and the nature of the employment relationship (such as part-time, contract, temporary agency). A modernized Equal Pay for Equal Work section of the Employment Standards Act. Given that women are the majority of workers in a non-standard employment relationship, the ESA should be amended to ensure part-time, part-year, contract, temporary agency workers are paid the same rate as full-time workers. Full funding for pay equity adjustments owed to women working to provide public services to Ontarians. Ontario delivers public services through its own employees or through transfer payment agencies without providing proper funding to ensure pay equity is both achieved and maintained for those doing women’s work. Sufficient funding for the Pay Equity Commission and Pay Equity Hearing Tribunal (for OHRC and HRTO), and restoration of the Pay Equity Legal Clinic for women. The Government must introduce effective and fully-staffed enforcement mechanisms to ensure compliance with the Act. The amendment of the Labour Relations Act to include card-based certification and expanded access to remedial certification without a vote. The Coalition further supports measures to improve union access to employee information to facilitate organizing. The Equal Pay Coalition wants Ontario’s Employment Equity Act to be reinstated. It’s time to reintroduce Ontario’s Employment Equity Act, repealed in 1995. This proactive legislation helped to redress workplace discrimination in recruitment, employment conditions and retention against women, racialized workers, aboriginal peoples and persons with disabilities – all major factors contributing to the gender pay gap. Pay disparities faced by racialized women, aboriginal women, and women with disabilities are greater. Access to better-paying jobs is a critical step in closing the gender pay gap. The Equal Pay Coalition acknowledges that access to collective bargaining is a strong tool to close the gender pay gap, and is calling for increased access to unionization. Unionization is one of the most effective tools to close the gender pay gap. One reason that the pay gap has decreased over the years is the increasing unionization of women, particularly in the public sector. The “union advantage” in pay is on average $5.11 per hour compared to non-unionized workers. Unions have a joint role with employers to create pay equity plans and unionized women are much more likely to receive pay equity adjustments which help to close the gap with their male co-workers performing work of comparable value. However, unionization rates are declining, particularly in the private sector. The rise of precarious employment relationships, such as short-term contract, temporary agency, and other forms has weakened the trade union representation of women. In order to redress the gendered wage gap and the increase in precarious work in the Ontario labour market, sectoral and broader-based bargaining approaches should be implemented. The Equal Pay Coalition is calling on the Ontario government to raise the minimum wage to $15 per hour. Women are the majority of Ontario’s 534,000 minimum wage workers. Aboriginal women, immigrant and refugee women, women with disabilities, and racialized women are even more likely to be working at the minimum wage. Any increase to statutory minimum wage laws serves as a down payment on closing the gender pay gap for vulnerable workers. The Coalition calls for the Ontario government to bring in emergency legislation to increase the minimum wage to $15 per hour, effective immediately. The minimum wage must keep up with inflation and keep on increasing until it is at the level of a living wage. 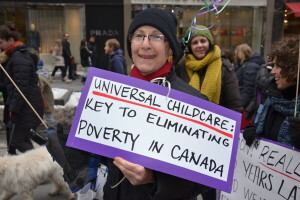 Access to quality, affordable child care is one of the biggest challenges for working women. The Equal Pay Coalition is calling on the Ontario government to provide an affordable child care program. In Ontario, there are licensed spaces for just 1 in 5 children and fees are upwards of $40 to $60 per day, per child. Many women work part-time because of lack of affordable child care. In 1988, the Government fully recognized that access to an affordable child care program was a cornerstone to women’s equality. Despite many other reports calling for affordable, high-quality child care, we have made little progress in access to a child care program. The time for a program is now. Public policies that don’t take into account the different and unequal circumstances facing women are not effective in closing the gender pay gap. The Equal Pay Coalition wants the government to vet policies for their impact, taking these factors into account. There is a systemic failure to account for the different and unequal circumstances facing women, particularly those who are racialized, Aboriginal, have disabilities, or are poor. Public policies often use an approach which assumes all employees face “similar” or “neutral” circumstances to predominantly able-bodied, white, male workers. All social and economic policies should be vetted by government departments for their impact, answering this question: Do they help close or widen gender and other equity pay gaps? Cabinet policy submissions should include a sign-off to ensure proposed laws and policies have been reviewed for their contribution to closing these pay gaps. Labour market knowledge, research, and monitoring that is sensitive to human rights is key to an effectively ending the gender wage gap. The Equal Pay Coalition recognizes that equity compliance must become an integral part of workplace practice. Employers need to mainstream equity compliances into their workplace practices, including analyzing the impact on vulnerable groups of recruitment and retention practices, pay and promotion structures, and conditions of work. A pay transparency standard would be a starting point to make this happen. The Equal Pay Coalition is urging the Ontario government to continue their strategy to end gender-based violence. Sexual violence and harassment are connected to gender inequality and contributes to the gender wage gap. A woman who is the victim of assault or harassed out of a job is left with few economic resources. A gender wage gap strategy needs to respond to the root causes of violence, including education, employment, and poverty. The Ontario government designed a targeted strategy to end gender-based violence. This strategy needs to be continued. It is time for the Ontario government to commit to the decent work agenda. For almost four decades, the notion of labour market “flexibility” has been one-sided. The employer’s main emphasis is to cut costs and find ways to reduce the unit cost of labour. The employment relationships most strongly associated with women and dominated by women–the precarious forms of part-time, contract, and temporary–have taken hold as the new model. The precarious labour market means predominantly lower wages, and less access to benefits, holiday pay, overtime pay, pensions, severance pay, and employment insurance. In today’s labour market, there is little balance between the power of employers and the many precariously employed women. The Ontario government needs to be pro-active in making development grants available to female entrepreneurs. The government needs to ensure that measures are in place to assist women who are truly own-account self-employed entrepreneurs (not disguised employees) in gaining access to grants and business development assistance, in a similar way to how male entrepreneurs have access to economic development grants.